Let’s be honest, the holidays are full of sweet treats and temptation. That said, I created this smoothie so that you can have something healthier to turn to when you’re having a moment. Like an I’m-craving-sugar-so-bad-I-need-a-treat-now! kind of moment. This Sweet Potato Pie Smoothie is low in refined sugar, and high in nutrients, fiber, and disease-fighting antioxidants. You’ll also get a fair amount of protein in this smoothie, due to the addition of hemp seeds. Bonus points if you add some ground turmeric for anti-inflammatory goodness. According to Dr. Andrew Weil, turmeric contains more than 2 dozen anti-inflammatory compounds — great for anyone dealing with health conditions such as arthritis and joint pain. 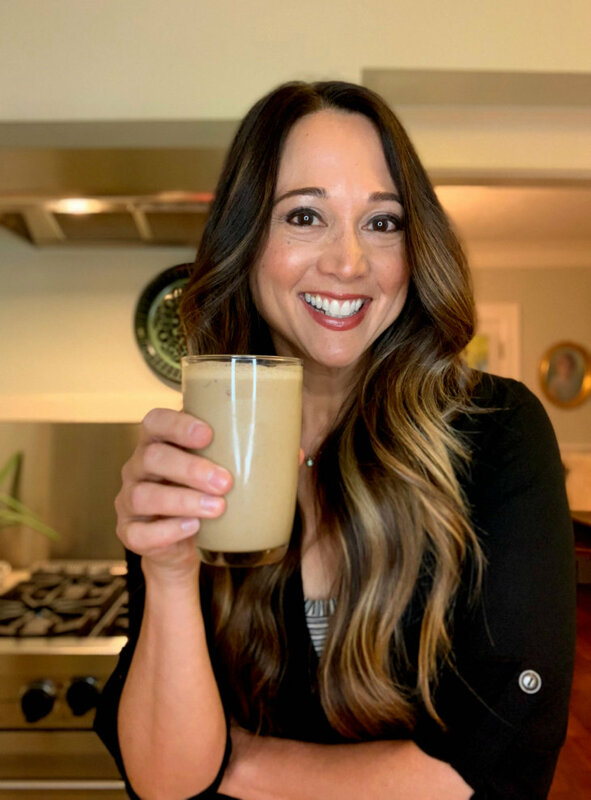 Here’s what I love about using ingredients such as sweet potato and pumpkin in smoothies — these vegetables are high in beta-carotene, which the body then uses to make vitamin A. Adequate amounts of vitamin A give us healthy skin, hair, and a strong immune system. And if you’re wondering about the use of molasses and maple syrup in this smoothie, here’s the deal. I don’t usually use liquid sweeteners (I use whole medjool dates). However, I want this smoothie to feel like a “treat” — decadent enough so that it can help you avoid eating the unhealthier sweets out there such as leftover pie, etc. By the way, molasses can be enjoyed without guilt — it’s high in minerals such as potassium, iron, and magnesium. We’re using a really small amount of maple syrup in this recipe. However, you can omit it altogether and you’ll still have one delicious smoothie. Add all of the ingredients to a high speed blender, adding the frozen banana and ice last. Blend until smooth and creamy, using the blender tamping tool if necessary. Pour into two glasses and serve. Grate a bit of nutmeg over the top, and garnish with chopped pecans (if using). NOTE: I use a microplane to grate the nutmeg. 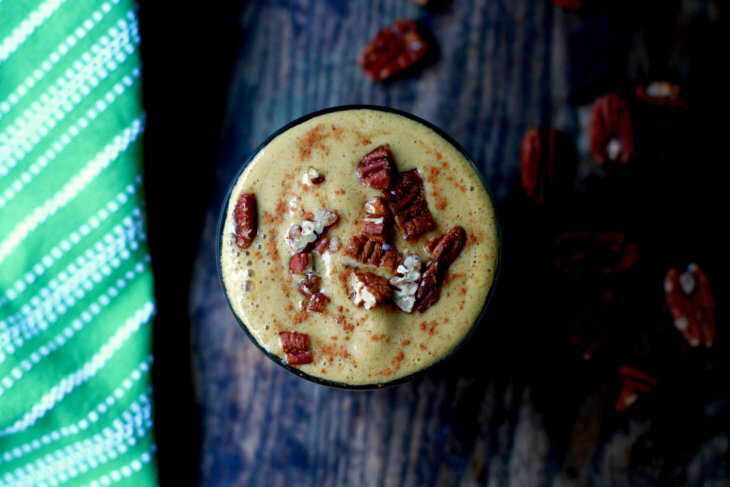 I hope you enjoy this recipe for the Sweet Potato Pie Smoothie. Remember to tag me on Instagram if you try the recipe. I love seeing your kitchen creations!